The Bearfoot Bistro team is eager to share their skills with you. Whether you are a passionate home cook, or just a passionate eater, a class with our kitchen brigade is a great opportunity to work in a professional chef’s environment – and have fun as you learn new techniques. Are cocktails your first love? Impress your family and friends with your mixology skills after a class with our bar team. 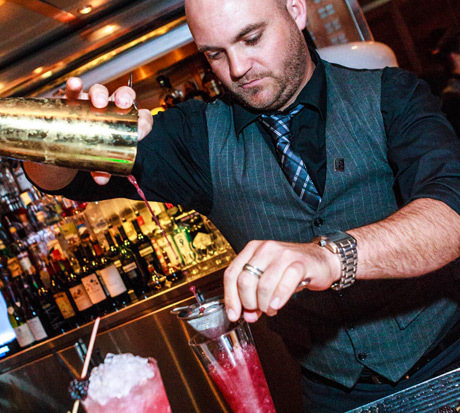 Learn the art and craft of a great drink, shaken or stirred. 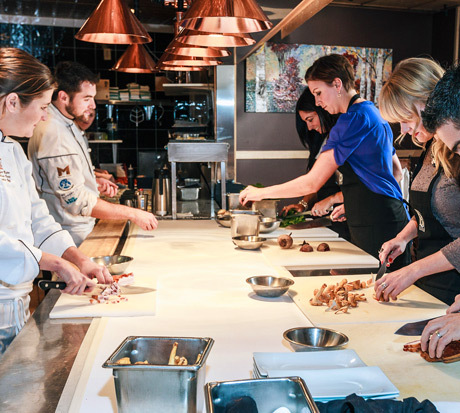 Our cooking classes introduce a number of fundamental techniques, including menu-planning and plating, basic butchery, preparation of sauces and purees, and a demonstration of key dessert techniques. But it’s not all work! As part of your class, the kitchen brigade will prepare a delicious three-course meal for you to sit back and enjoy. Cooking classes run three hours. You are introduced to the chefs and given a tour of the Bearfoot Bistro kitchen. Everyone is assigned to a personal workstation and provided with a Bearfoot Bistro apron. Our pastry chef will introduce you to a selection of basic dessert techniques and show how simple plating skills can create an elegant and sophisticated look. Preparation of first course: you learn the basics of emulsions and light flavor combinations, and how important portion control and plating style are to a successful first course. Preparation of main course: after an introduction to basic butchery, learn how to cook protein to temperature and the fundamentals of making perfect sauces and purees. The importance of butter at each stage will become clear. Sit back, relax and allow our chefs to prepare your three-course meal. Every class requires 1 Chef and 1 Sous Chef. For every additional 10 guests, 1 additional Sous Chef is required. From $25 per person. Prices vary depending on wine selection. 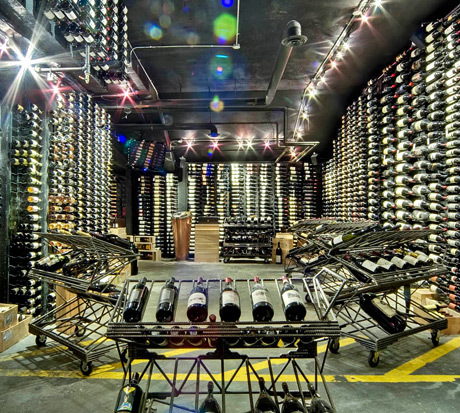 Experience the ancient art of sabering in our underground wine cellar and open a bottle of Champagne with a sword. Then taste selected vintages as our sommeliers explain the art of pairing wine with food. Learn everything there is to know about oysters: how to know they are fresh, how to shuck, and how to serve them. 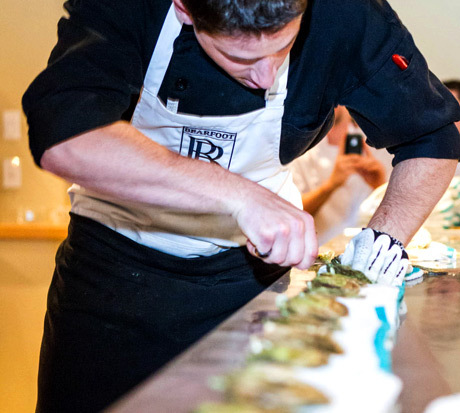 Our professional shucker will also show you how to make a classic mignonette. Learn the art of crafting a great cocktail, using classic and modern techniques. Working in small groups, you will be introduced to Tiki and Prohibition drinks, learn about emulsifications, infusions and foams, and take a walk on the cutting edge with liquid nitrogen and molecular caviar. After trying your hand at a number of different cocktails, sit back and allow our bartenders to mix up a selection for you to enjoy.